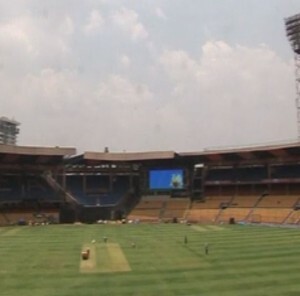 STORY: A 400kW rooftop solar power plant at Chinnaswamy cricket stadium in India’s southern Bengaluru city, pegged to be world’s first, is all set for its inauguration on Wednesday (April 15). The power plant is expected to provide for 40 percent of the stadium’s energy requirement. It will not only save energy and reduce carbon dioxide at the stadium, but will also ensure a bright pitch to the cricketing nucleus of the state. The installation work of the solar power plant was successfully completed on Thursday (April 09). Spokesperson of Karnataka State Cricket Association (KSCA), Vinay, said the plant is designed to generate 600,000 units a year, which is enough to power 200 AEH (all electric homes) using 3 kW power annually, and also cutting down about 600 tonnes of carbon dioxide emission annually. “We are extremely happy to have launched this solar concept at Chinnaswamy Stadium. As you rightly said this is the first time a cricket stadium across the globe have to generate such amount of solar energy. So the Karnataka State Cricket Association… we have 400 kW solar unit which generates about 600,000 units which we will get about 40 percent of our power to be made from the solar power generator,” said Vinay. The excess power will be sent to the Bescom grid with Karnataka State Cricket Association (KSCA) getting USD 0.153 (9.56 INR) per unit. Bengaluru-based solar solutions enterprise RenXSol Ecotech Pvt. Ltd. executed the project for the KSCA, which was approved, commissioned and installed in less than 50 days, he added. The Indian cabinet in February approved state-run power producer NTPC Ltd’s plans to set up 15,000 megawatt of grid-connected solar projects, which would be completed in three tranches. The rapidly falling cost of solar power has ignited interest in its potential in Asia’s third-largest economy, which relies on coal for three-fifths of its energy needs while solar supplies less than 1 percent. Prime Minister Narendra Modi aims to make India one of the world’s largest renewable energy markets, targeting 100,000 MW of output by 2022 from just 3,000 MW currently.